After the no-show sunrise on Cadillac Mountain, I drove to Bass Harbor where one of the most photographed lighthouses is located. 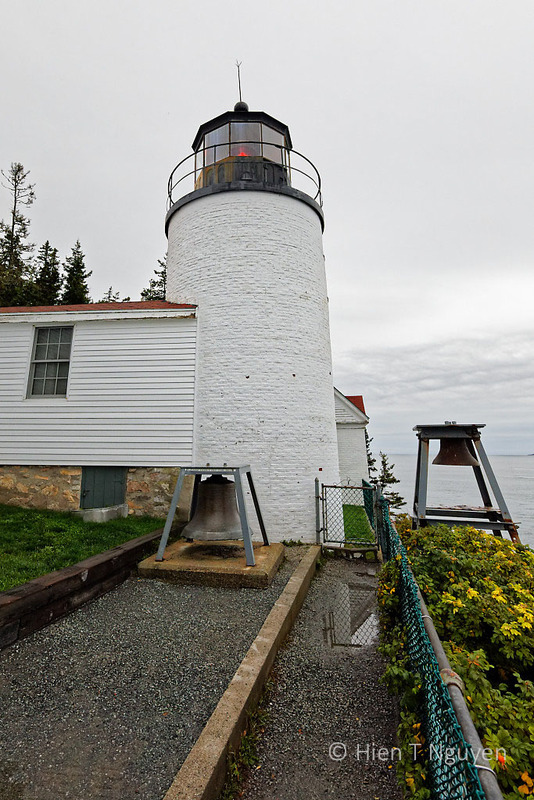 The Bass Light Station, as it is officially named, looked small up close, standing only 32 ft tall, or less than 10 meters. It is currently the residence of a member of the Coast Guard, so you cannot go inside it. It is a functioning lighthouse with an occulting red light which is on for 4 seconds then off for 4 seconds, day and night. 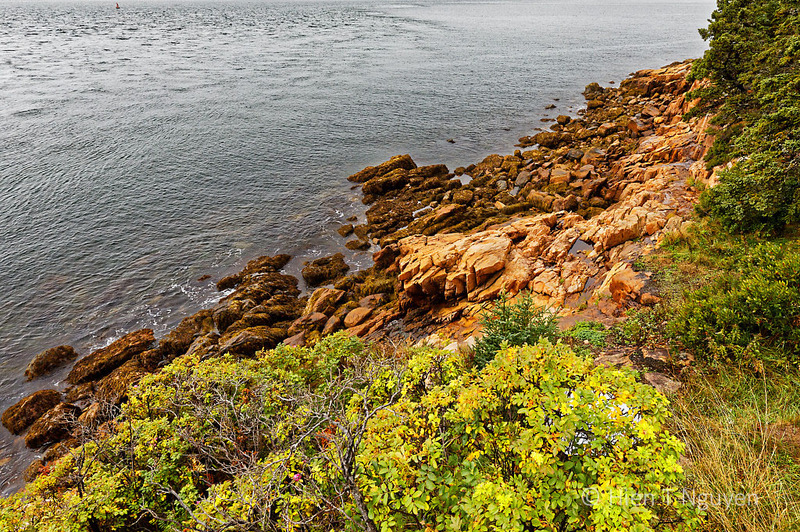 It used to belong to the Coast Guard but in November 2017, Acadia National Park announced that it will take ownership. It is working on renovation plans to make it more accessible and “revenue producing”! To shoot the iconic photos that you often see of the lighthouse, you need to wait for low tide and then climb down some stairs to jagged and slippery rocks on the beach. It was not a pleasant experience but still many visitors, including young children, did it. Following are some photos that I took while sitting or leaning on the rocks. Please let me know which one you like best. 1. 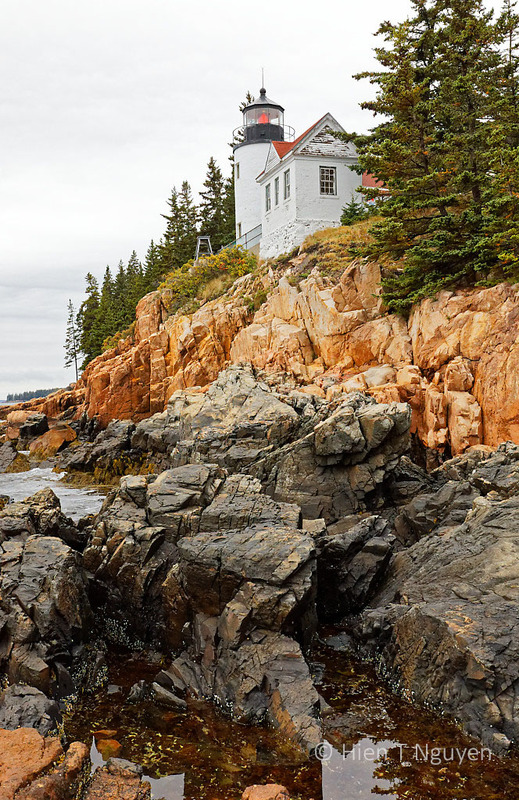 Bass Harbor Light Station. 2. Bass Harbor Light Station. 3. 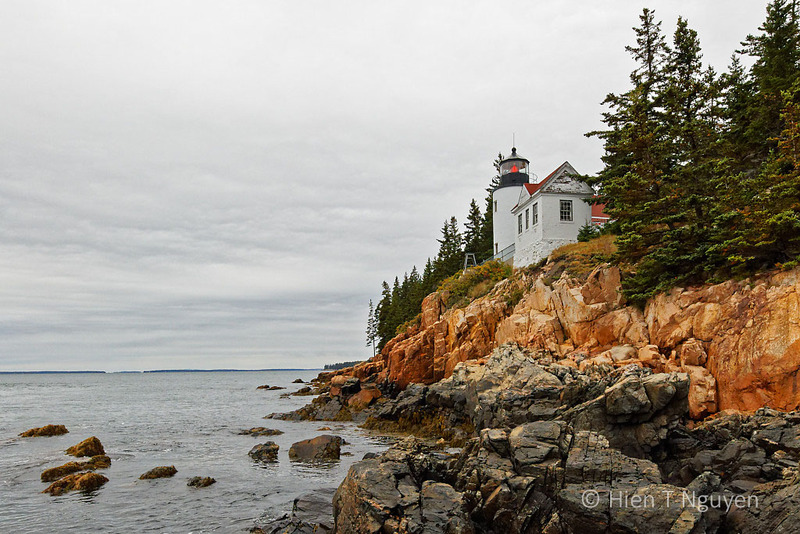 Bass Harbor Light Station. 4. 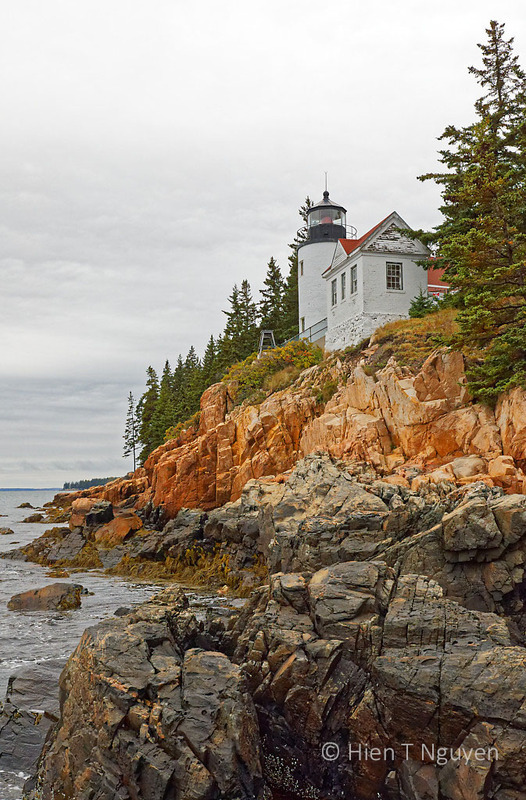 Bass Harbor Light Station. Here are two views of the beach. Beach at Bass Harbor Light Station, looking South. Beach at Bass Harbor Light Station, looking North. They are all so beautiful, Hien! 🙂 Well done all way around! You got all the ingredients people like! It’s hard to decide! 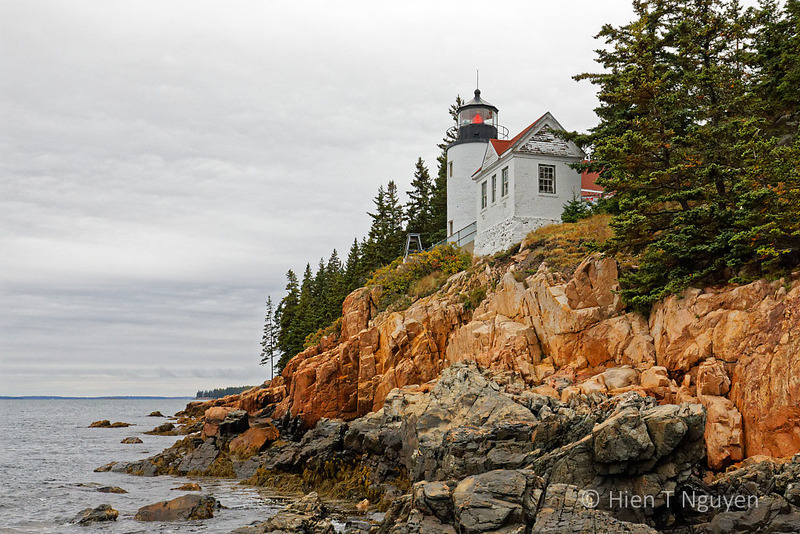 I love the different colors of the rocks….and the way the lighthouse nestles into them, with the evergreens around it. Just beautiful. I thought I liked the first one best, then the second, then the third…. 🙂 Gee, I’ll just narrow it down to the second and third, and the last two are great as well. Beautiful work! Good choices! The second photo has a little reflection of the roof. Perfect season to visit, Hien and you made great work of the raw material. Great post. Well, if I was going to paint one of these photographs, I’d choose no.4 because I like the rocks – they are a fantastic colour. It also has a bit of sea and trees off in the distance. I see what you mean, Emma. Thank you very much! It is a very photogenic lighthouse indeed! As for me, #1 and #4 especially grabbed my attention. Thank you very much for your feedback, Takami! #1 and #4 for me, too 😉 We just went to Acadia National Park, but didn’t see anything. Next time, I will drive by myself instead of going with a tour group! Thank you so much for sharing these photos! Thank you Helen! I did see many tour buses at Acadia. Perhaps one of them was the one you were on? Thank you very much for your feedbacj, Eliza! You are right about them not being easy to shoot. Boy they’re all beautiful, but I think I like number 1 and 2 the best! 🙂 It seems to really capture the quiet mood of the place. Thank you very much for your feedback, M.B.! All beautiful, but I think #1 and #4. I like seeing the tops of the trees. Be careful out there! Thank you for your feedback! Did you notice the roof reflection in the water? Took me a while to see it…might have missed it if you didn’t mention it….Beautiful!! Thanks for making the treacherous hike down, Hien, but what a view from there. I like all your photos, but since you asked, my favorite is #4. You get a close-up of the craggy rocks and lighthouse, but also have a good vista of the background coastline. Thank you very much Jet! I think No 4 was the hardest one for me to take. 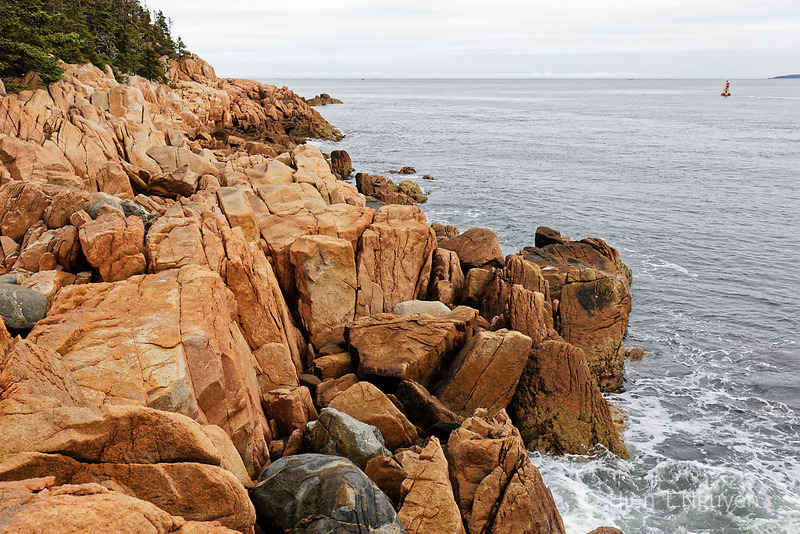 Very rocky coastline. I like 1 the best because to me it shows it more as the lighthouse in the distance. They are great shots though. I like the color variations of the rocks. Asking us to choose one isn’t fair, because I love them all. But since you asked, I vote for number 4 because it shows both the context of where the light is located and the details of the light itself. Most of all, these images show why it pays to take a series of images to highlight different aspects of a scene, which I’m very glad that you did. Thank you very much Jerry! When there is a beautiful, interesting scene, I do tend to take several photos from different angles and viewpoints. I like number 3 Hien. Thank you for your feedback! Number 3 has a little reflection of the roof of the house. Number 1 seems to give it a remote, hard to get to, emotional impact. If you desire more detail the others would be a better choice – but #1 captures seems to capture the personality and context of a light house.